Welcome to Peaceful Warrior Martial Arts & Healing Center! Peaceful Warrior Martial Arts is the valley’s premiere martial arts training facility. 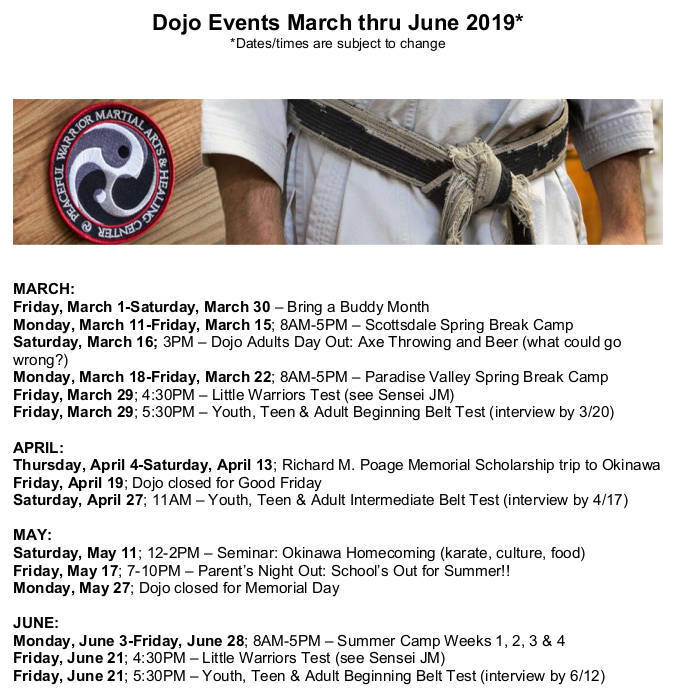 Our karate school is based in the Scottsdale and Paradise Valley, Arizona area. Students enjoy a wide range of youth, teen and adult classes in various martial arts forms. From traditional to contemporary styles, we have a martial arts program that’s right for everyone! Our base is traditional Shorin-Ryu Karate, one of the oldest systems from Okinawa, Japan. Students learn long-established kata, self-defense techniques and karate fundamentals in this deep-rooted practice. Another classical art Peaceful Warrior specializes in is Japanese Jujitsu, utilizing grappling techniques, locks, holds and ground escapes. We also teach the customary Kobudo, or Okinawan weapons, tradition. This system is rich in history, and stems from ancient Okinawan warriors. For the more modern martial artist, we offer an array of contemporary classes including Street Self Defense and a unique Women’s Self-Defense Program. No need for the added cost of a gym membership! Our distinct center offers a gym, personal training and a variety of Fitness Classes including Yoga, Zumba, Bootcamp and Kick Boxing. Fitness enthusiasts, from novice to pro, can work out while your child or spouse trains martial arts, or supplement your own karate program with flexibility and strength training exercises to maintain tip-top shape. It’s never too early to start karate! We boast a Little Warriors Program for children ages 3-6 so your little one can begin to learn the basics of karate, motor control, balance, listening skills and confidence. 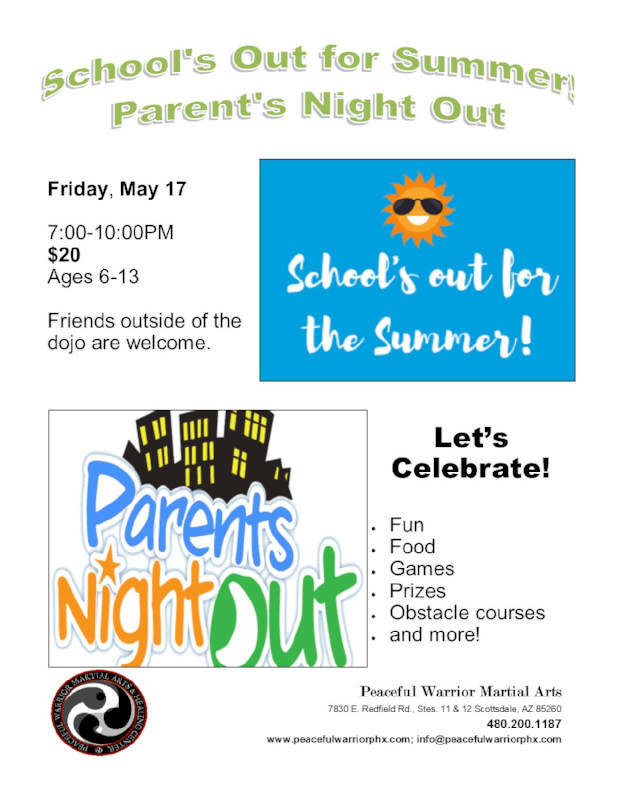 Any busy parent appreciates our selection of enriching after-school activities, school break and summer camps, quality martial arts programs and leadership skill sets that Peaceful Warrior Martial Arts offers. Our After-School Karate Program gives children ages 5 to 13 an advantage in life. Mom and dad, have peace-of-mind that your children are in a safe and fun environment, all while learning character development skills like discipline, focus and respect that translate in to all areas of life. We provide transportation from school, assisted homework, healthy snacks, games and karate classes each day! No child is ever bored! 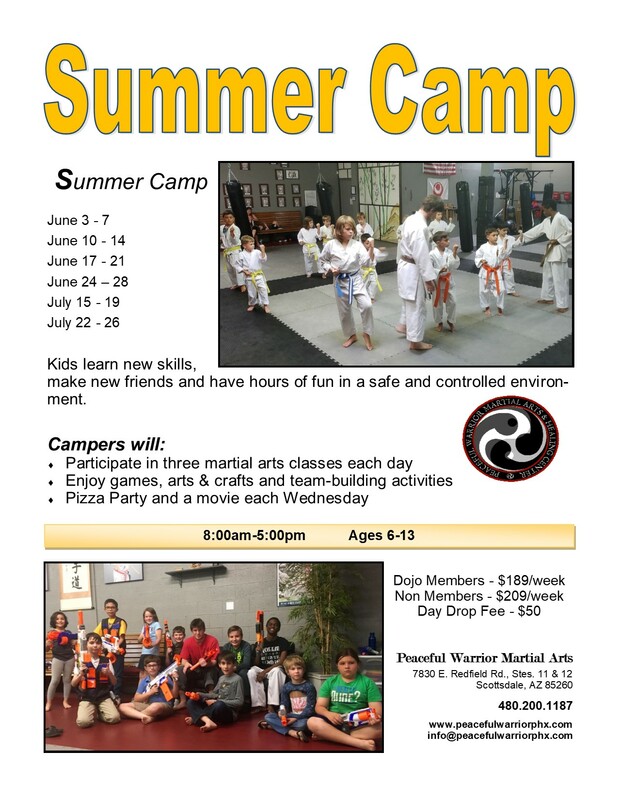 We host Summer, Winter, Fall and Spring Break Karate Camps for children ages 5 to 13. Students learn karate basics and self-defense skills. They build confidence, make new friends and get in to shape. Kids appreciate a break from martial arts lessons and attend stimulating field trips including rock climbing, art projects, zoo tours, skating and sporting events. Peaceful Warrior Martial Arts is the pioneer of an exclusive program for children and families affected by ADD/ADHD! Co-designed by a world-renowned psychologist, our martial arts-based ME Program (Mental & Martial Enrichment) assists with the mental and physical development of children afflicted with ADD and ADHD. By using the study and practice of martial arts combined with proven techniques and methodologies to increase mental function, participants in this one-of-a-kind program improve mental focus, self-control, school performance and build and maintain healthy relationships with peers, family members and others. We build champions! Our Tournament and Demo Team is comprised of students, ages 5 to adult, from beginners to advanced competitors. Our Team has been rated #1 in Arizona and #4 in the nation five-years running. Peaceful Warrior actively participates in tournaments on a local, national and world level. They also provide demonstrations throughout the valley supporting their communities. These activities build focus, leadership skills, self-confidence and long-lasting friendships along the way. Finally, we believe that performance, whether in the dojo, at home or in the workplace, depends on your physical, mental and emotional abilities. That means taking care of yourself is imperative. Karate focuses on external energy (yang). We offer a selection of therapeutic modalities (yin) in our Healing Center that include massage, Reiki, hypnotherapy, nutrition and more. Taking care of the whole body guarantees a longer, happier and healthier life.